There was a time roughly a decade prior to the release of M. Night Shyamalan's latest, Split, where the writer/director's original storytelling had started to develop a less-than-stellar reputation, notably for his dependence on plot twists that were more elaborately anticlimactic than satisfying or shocking. People came to expect the big "Shyamalan twist" following his deliberate exposition, which tapered off from the chilling and eloquent strangeness of Unbreakable's superheroic reveals to the inane ecological surprises unearthed in the broadly-panned The Happening. Watching how Shyamalan's creations have gradually spiraled out of control over the years makes one wonder how his earlier intuition toward characters, his attention to darker themes, and his fierce grasp on mounting tension might've looked under other circumstances, had he controlled the scale of his projects and stayed truer to his more expressive and human elements. Split, a psychological thriller hinged on kidnappings and multiple personality disorder, does precisely that, which is why it's such an impressive, disturbing return to form for Shyamalan. A trio of high-school girls are out shopping at the local mall: two (Haley Lu Richardson; Jessica Sula) are your typical contemporary, upbeat teenagers, while the third, tag-along Casey (Anya Taylor-Joy), projects a darker and more stoic personality, a result of her traumatic past. On their way home, the three are strategically kidnapped by a man (James McAvoy) sporting a bald head and glasses, locking them in a dimly-lit, seemingly underground room filled with sliding locks and zero visible exits to the outside world. The girls naturally develop fear toward their captor, furthered by the obsessive-compulsive attitude that gives him an added unsettling edge. What they soon learn, however, is that this is one of many personalities within the man, revealed to be a sufferer of dissociative identity disorder through his sporadic sessions with therapist Dr. Fletcher (Betty Buckley), who views the higher functions of the disorder through a different lens. For Casey and the girls to escape, they'll have to sort out and exploit the many personalities of Kevin, though there's no telling what others loom under the surface. Like seeing dead people in The Sixth Sense and the presence of aliens in Signs, writer/director Shyamalan once again lets conceptualization run the show in Split, that of multiple personalities being involved in the same kidnapping plot and blurring the lines of awareness and responsibility between each one. The difference lies in the reality-bound nature of his latest conceit, tapping into a degree of relatively realistic mechanisms in the alternating personas, a glimpse at how the actual mental disorder functions. Sure, variations of this have appeared in other psychological thrillers, from Hitchcockian classics to modern big-twist suspense flicks; however, the dangers presented to the three girls are specific and candid in relation to the disorder, with the villain's observable shifts in character offering states of consciousness for them to fear and others which they can use to their advantage. There's no speculation as to whether that's what going on, but plenty of anticipation behind seeing the directions that Shyamalan's willing to take it through his creative scripting. Turns out, Split takes the multiple-personality concept farther than one might anticipate from a PG-13-rated suspense film built around captured teenage girls, and it's hinged on the shifting, tenacious performance from James McAvoy as he brings the villain's many iterations to life. Each one has its own distinctive traits that alter their relationship with his captives, spanning from an obsessive-compulsive aggressor, "Dennis", who's responsible for the brunt of the threatening suspense, to a 9-year-old boy, "Hedwig", who ends up being a quirky dose of comedic relief and a window into the villain's vulnerabilities. Observing how the personalities are kept inline and how he interacts with his longstanding therapist becomes just as much of a study of his character -- and the unique parameters of his condition -- as it does a suspense film. What's fascinating about McAvoy's performance isn't just how he takes on these distinct personas, but how they all share very faint common traits tied to the actual person lying underneath them all, brilliantly realized with McAvoy's ferocious eyes and sardonic speech. The thrills in Split swing on those changes in the captor's psychosis, along with the resourcefulness of the three girls trapped in a musty underground bunker, filled with stone walls and twisted pipes that give this psychological thriller plenty of texture. Shyamalan has written a trio of young women who aren't comfortable being victims, though: they're smart and tenacious, to a point where they even resist the idea of strategic submissiveness. The brains getting them through their dilemma is Casey, whose harrowing back-story plays out in concurrent flashbacks that have deliberate, meaningful ties to the film's cerebral suspense, empowering her through the suffering of her childhood. The Witch's Anya Taylor-Joy channels distraught gazes and unassuming willpower into Casey as she adapts and tries to outwit their captor, taking on its own significance amid the film's breathlessly claustrophobic plays on dominance and deception. She's a heroine who earns the right to be rooted for, driven by another performance from Anya Taylor-Joy that deepens the emotive reality of the chaos going on around her. 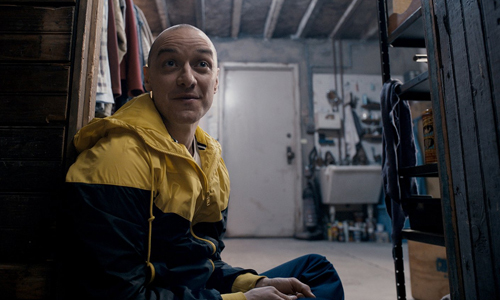 Split wouldn't be one of M. Night Shyamalan's works without a twist or two, so it shouldn't come as a surprise that he's got a few tricks up his sleeve, ones that directly feed off the two-dozen beings residing in the depths of Kevin's mental space. Shyamalan isn't relying on them to make or break his film this time, though, as the instability of Kevin and the efforts of Casey and the girls to escape from his clutches -- their clutches? -- stands strong on its own as an absorbing demonstration of psychological terror, even if there are a few engineered red herrings and obstacles that serve little purpose beyond doubling-down on the captives' desperate conditions. This twist, a manifestation of the true power of the personalities vying for control within the villain, takes Split down an outlandish, borderline unnatural path, yet it never loosens its grip on the intentions and significance of what happened prior, all while sinking its teeth into an explanation to why Kevin captured the girls. What Shyamalan comes up with at the end, and the motivation behind piecing it all together, has brought the director back into the light.